Although we regularly encounter cutting edge electronics with amazing features, we still pause now and then to marvel at how far technology has advanced. For any of you old enough to remember the early days of personal computers, modern equipment is an absolute marvel. If you can recall when hard drive capacity was measured not in terabytes or gigabytes, but tiny little megabytes, it’s hard not to feel amazed watching the increasing capacities of flash memory. SD cards can fit hundreds of gigabytes with companies currently developing 1 terabyte prototypes. A few decades ago, this would have required hard drive arrays the size of a city bus. 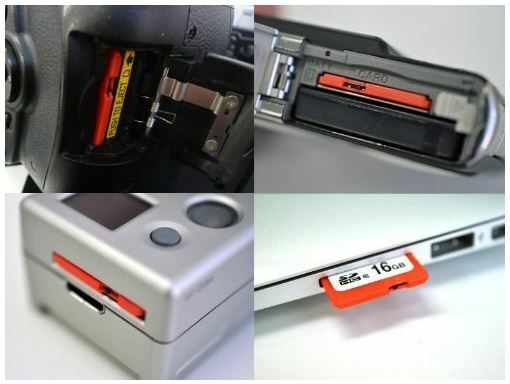 While most SD cards do one thing, provide storage, clever manufacturers have managed to squeeze even more functionality out of these tiny marvels. While definitely not a mainstream product, SD cards with embedded WiFi antennas have actually been commercially available for over a decade. These WiFi SD cards represent a great way to improve the functionality of a non-network enabled device, particularly with cameras and video cameras. Digital cameras obviously have tremendous convenience compared to an old film camera, but depending on your usage, taking out the card to transfer photos may still be inconvenient. Many manufacturers began adding WiFi support directly into some of their cameras, but many models still lack this feature. If you could benefit from a WiFi enabled SD card, read on to find out which model has the features you’re looking for. EZ Share products are made by LZEAL Information Technology Company, an electronics manufacturer based in China. While not a household name in the United States, you can often get great deals and features from some lesser known name brands. Let’s see how the EZ Share products stack up to the competition. There isn’t a lot of room for variation when it comes to SD card design. Since all cards must fit in the standard SD slot size, every physical package must remain identical. Therefore, the only ways manufacturers can distinguish their products is by modifying the color, labels, and logos. The first thing we noticed about the EZ Share card was the distinctive orange color. To anyone familiar with these products, the EZ Share design looks remarkably similar to EYE-Fi, the original company to make a WiFi SD card. Though the label design looks different, utilizing the same orange color seems unlikely to be pure coincidence and may be an attempt to make consumers think they are the Eye-Fi brand. Regardless of motivation, the bold color does stand out among other SD cards which remain mostly black with white lettering. 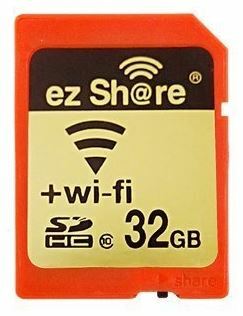 EZ Share WiFi enabled SD cards come in capacities ranging from 4 gigabytes to 32 gigabytes. While this may have seemed like a large storage amount a few years ago, these days SD cards can carry significantly more storage capacity. While we understand WiFi remains the big draw, when even micro SD cards can achieve 256 gigabytes, there’s a certain point that the small size may turn away prospective buyers. The EZ Share cards support numerous photo and video file formats such as JPG, AVI, MP4, MOV, and 31 different RAW formats. The integrated WiFi hotspot supports 802.11 b, g, and n for quick transfer rates and multi-channel downloads allow up to 5 users to access simultaneously. One nice feature was the inclusion of a physical switch to disable WiFi mode when not needed to conserve battery power. While the read and write performance of the EZ Share card met the requirements for Class 10, it did so just barely. Transfer rates averaged about 15 – 19 megabits per second for reads and right around 10 megabits per second for writes. While this bumps right up against the 10 Mb/s requirement for Class 10 designation, it does successfully maintain adequate speeds and didn’t exhibit any problems recording video at Full HD, 1920 x 1080p. EZ Share provides free app download for iOS, Android, or Windows devices. This app allows you to control the functionality of the card. You can enable Auto Push to wirelessly and automatically transfer every photo and video or you can also manually download batches, selections, or an entire directory. Through the app you can directly edit your photos with rotation, crop, collage, and filter options. 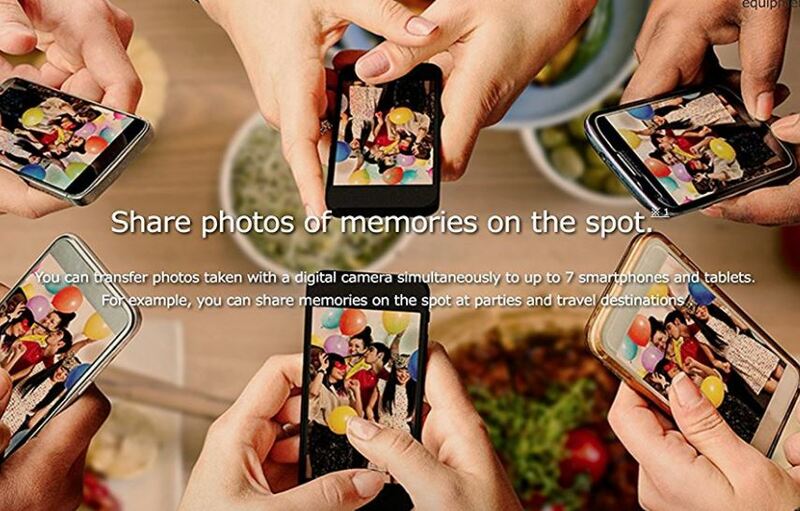 You can also directly share your photos with a number of social media sites. The only feature missing from EZ Share is WiFi pass-through. This means that in order to connect to the EZ Share card, your device must connect directly and individually to the embedded hotspot. This may impact your ability to use other internet functions on your device and you can only connect to one EZ Share card at a time. Overall, while EZ Share may not be the most premium brand of the batch, it delivers a lot of functionality and fair capacity at a reasonable price. Transcend Information, Inc. is a technology company based in Taipei, Taiwan. 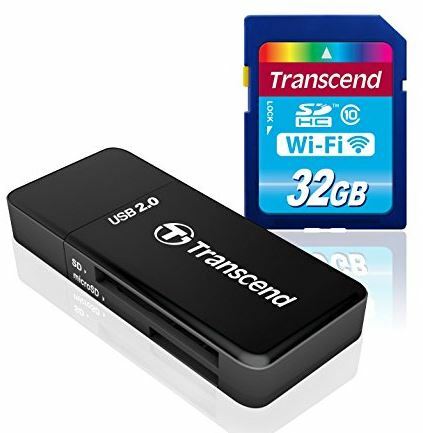 With a portfolio of over 2,000 items, Transcend produces a wide range of products mostly focused on memory cards and storage devices. The TS32GWSDHC10 is Transcend’s 32 gigabyte variant of their WiFi SD card family. 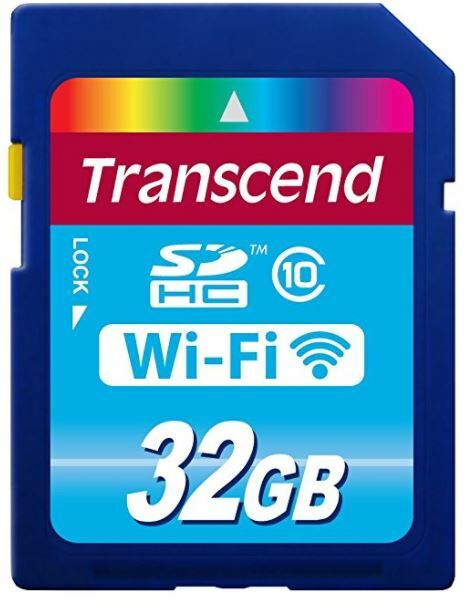 Transcend takes the standard SD card format and uses a dark blue plastic with a light blue sticker. The distinctive rainbow accent at the top of the label definitely stands out to the eye compared to many bland-looking competitors. While the EZ Share card included a WiFi switch, the Transcend card includes a more standard sliding lock switch. With this switch engaged, you can still read data from the card but lose the ability to write or overwrite anything. Transcend offers WiFi enabled SD cards in either 8 gigabyte, 16 gigabyte, or 32 gigabyte versions. All cards come with a Class 10 performance designation. Again, while this size and capacity are acceptable, they can feel a bit dated by modern standards of other cards. Speed classification can cause a lot of confusion with different rating standards. 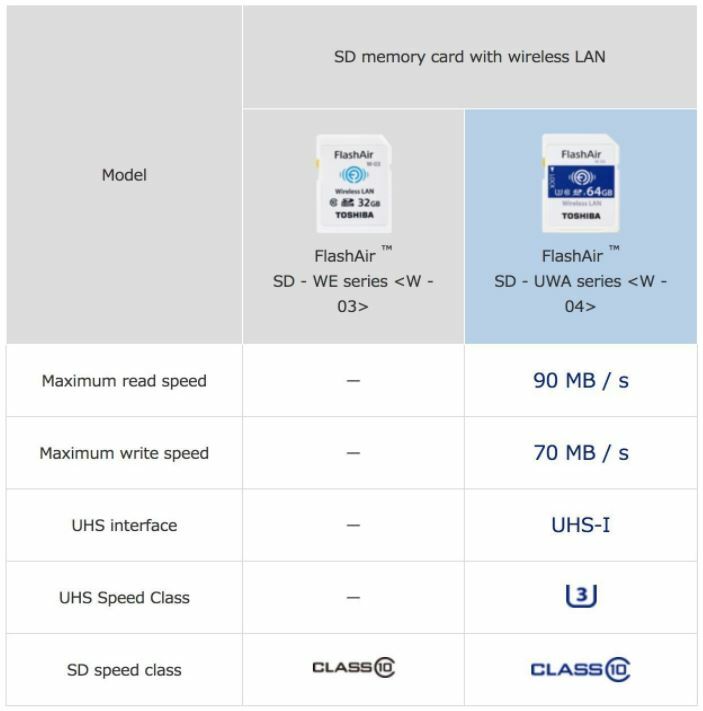 Class 10 technically has the same requirements as “UHS 1,” sustained write speed of 10 MB/s. While adequate for Full HD 1080p video, it isn’t enough to shoot 4K, which requires a UHS 3 capable card. Transcend supports JPG, BMP, PNG, AVI, MOV, MP4, M2T, MTS, and M2TS. In real world, mixed testing, the Transcend card averaged between 13 and 17 MB/s. This places it comfortably above the 10 MB/s minimum for a Class 10 card, but we’d advise looking for a faster card if you plan to shoot 4K video. While the wireless connection supports 802.11 b/g and n, Transcend only recommends a range of 32 feet. This likely allows them to use less of your device’s battery by limiting the power of the wireless radio. Unlike the EZ Share which requires a direct WiFi connection to your device, Transcend supports both an app connection and a direct browser connection. This adds a great amount of convenience particularly if you want to access files from a PC. By simply pointing any web browser to the correct IP address, you can directly access your media without any installation or interruption of your internet connection. The Transcend app, available for iOS and Android allows you to instantly view and share photos and videos while also posting to popular social media platforms. Up to 3 devices can access content from the card at one time allowing for simple sharing among friends. Toshiba, certainly the most prominent manufacturer we’re looking at today, makes a tremendous variety of electronics from laptops to TVs and phone systems. The FlashAir card we’re reviewing today represents the 4th generation of the product line from this market-leading company. Toshiba altered the 4th generation appearance somewhat from the previous versions. While they kept the white SD card with a yellow switch, the labeling has changed. Before, the lettering was all black with a blue logo, and now a dark blue rectangle appears with white letter for the card info and logo. It’s a classy look and the bright white card does attract attention. The yellow switch does perform the standard data lock function, but all in all, as with most SD cards, it’s a fairly standard design aside from the color choice. Here’s where Toshiba really pulls away from the pack. While the other manufacturers seem to rely on cards designed a long time ago, Toshiba continues to innovate with their 4th generation WiFi SDHC cards. Available in 16, 32, and 64 gigabyte capacities, Toshiba wasn’t just content to increase the storage space. Given the rise of 4K video, older Class 10 cards are unlikely to keep up with the higher data transfer rate requirements. Toshiba understood this and ensured the new 4th generation cards were UHS 3 rated, guaranteeing sustained transfer rates at least above 30 MB/s. Toshiba does support pass-through internet, allowing you to maintain a network connection on your device even while connected to the SD card. Additionally, up to 7 people can connect simultaneously allowing for easy media sharing among friends. The UHS Class 3 designation led us to believe the FlashAir would far surpass the slower Class 10 competitors. Toshiba even surpassed our expectations. While UHS 3 requires 30 MB/s, in testing the FlashAir 4th Generation was able to read and write between 70 and 90 MB/s. While this may not be high enough for professional grade, extremely high bitrate 4K video, it should be more than enough for most standard consumer camcorders and DSLRs. WiFi transfers went at about 30 megabits per second, but this is highly dependent on your device and WiFi environment. Toshiba’s FlashAir app for Android and iOS adds good functionality to the products. You can select Photo/Movie mode to display thumbnails of media or a folder view to look at any files within the folder. You can also share files directly via email, Twitter, or Facebook. We found the app useful and functional, and it’s nice to have the option to share with up to 7 users simultaneously. The improved specifications of the Toshiba FlashAIr 4th Generation made it extremely fast and a breeze to use. Which WiFi Enabled SD Card Is Right For Me? A WiFi enabled SD card, as we mentioned previously, certainly isn’t required technology for everyone. Since many people are content to simply pop out the card to transfer files, and many newer devices are getting WiFi baked in, the market for these cards started small and will most likely shrink as time goes on. However, we have no problems with niche products. It’s nice to know that companies will present a solution to problems you may have even if they may feel uncommon. You certainly wouldn’t get rid of a good DSLR camera simply to upgrade to one that had WiFi, so it’s nice to have a relatively inexpensive upgrade option. While there was nothing inherently bad about the EZ Share and Transcend cards, it’s clear that these products haven’t had an upgrade in a few years. SD Class 10 may have been the best of the best at one time, but it’s certainly showing age with the rise of 4K. 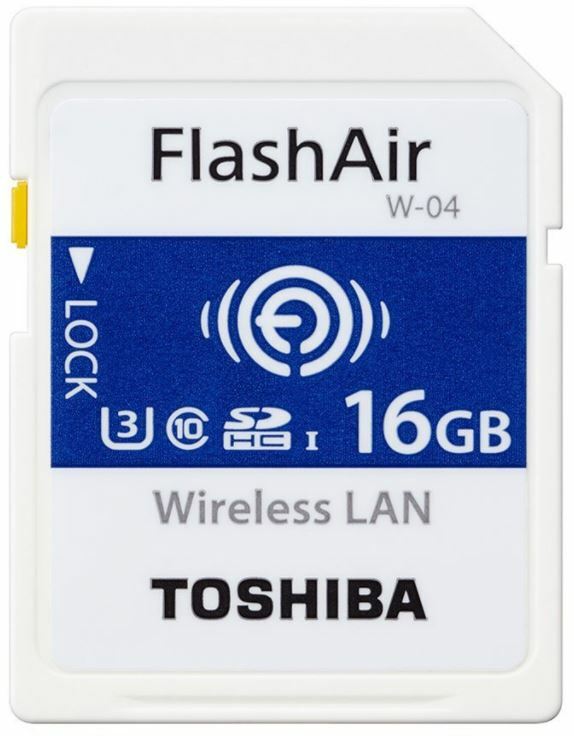 Toshiba’s 4th Generation FlashAir cards demonstrate that Toshiba hasn’t given up on the WiFi SD card market yet. With transfer rates of up to 90 MB/s, the FlashAir runs circles around the EZ Share and Transcend cards, as it does the earlier generations of Toshiba FlashAir cards. While features differ slightly card to card, all three offer useful apps to expand the capabilities beyond simple wireless data syncing. Only EZ Share did not allow internet pass through. Though Toshiba had the largest capacity available at 64 gigabytes, you still need to ensure this is enough capacity for your needs. While 64 gigabytes can store a lot of photos, it really isn’t that much video depending on the compression your camera uses. Ultimately, while it may not feel like an extremely fair comparison to include Toshiba’s newest product line, this represents what each manufacturer has available on the market today. If you’d like to expand the capabilities of your non-wireless DSLR or camcorder, the Toshiba FlashAir 4th Generation’s useful features and blazing UHS 3 speed make it the hands-down winner. Hello, can you use a wifi sdcard in a smartphone without problems? I want to connect without the usual usbwire between computer and smartphone. Not unless your smart phone accepts a full size SD card. First of all I feel like I’ve been living under a rock!! Seriously wifi SD cards WOW! I have a Nikon D90 and a Sony RX100M2 … I use the Sony for scuba in a housing with the a strobe. The pics are awesome! My question is which one of these cards would be best for both my cameras? I’m trying to DIY a photo booth for a 50th birthday party and I want to be able to use one of my cameras with my ipad! Thanks so much for the review! Have you seen the Toshiba FlashAir 4th Generation’s in 64GB recently? I’m in the market (for christmas wish list) for one and want the 64GB version but can’t find it. Thanks! Before pulling the trigger on one of these or perhaps one not mentioned, could you possibly revisit this from the point of view of best phone app? I have a Nikon d7000 set to shoot raw and jpeg. Raw for serious editing but ideally my 2nd card slot would be a wifi SD for jpegs only. Ready for quick transfer to phone and then onto some social media app. After a quick look on the iOS App Store: transcend, toshiba and eyefi apps all have poor ratings and reviews. I can’t help but think that these wifi cards all fall flat of the main purpose if the app design/support is lacking. Can you use any of the Wifi SD cards to store .txt files or .csv files, instead of Photo files? Thanks.. I needed this. I have been using an Eye-Fi mobi 32gb (orange) card for a few years. Love it.. Been telling people about it. the other day I googled the eye-fi and saw it selling on amazon for $449!!!!! I was lost. I paid $60. so I started looking and still no idea why. so I’m out looking for a replacement. I am not concerned with anything above 32gb but now I think I will go for the Toshiba and price them… maybe the 64gb if not too bad. these cards are awesome. I was taking pics at an MMA belt testing and I use my CF for raw and the SD for 1080 jpg for quick checkins into facebook and someone I know that was there taking pics was like… how are you adding pics? your still here!!!! hah.. Thank you for the review. Do you know of an option with cellular data rather than Wifi or an SD card that holds a sim card? I want a lot more range than wifi provides work with others in remote locations.